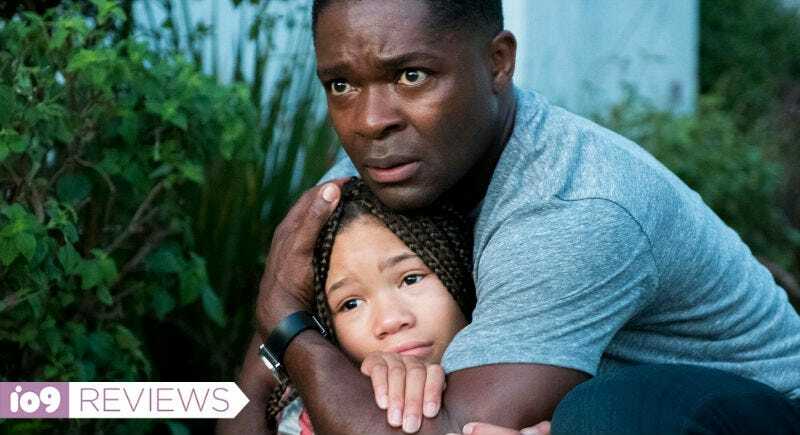 David Oyelowo and Storm Reid in Relive, which premiered at Sundance 2019. The one person you don’t expect to call you after a funeral is the person whose funeral you were just attending. But that’s what happens to Los Angeles detective Jack Radcliff (Selma’s David Oyelowo) after his niece Ashley (A Wrinkle In Time’s Storm Reid) is murdered. Somehow she’s calling him, very much alive, even though she’s dead. And things are off to the races. Relive, which had its world premiere Sunday at the 2019 Sundance Film Festival, was written and directed by Jacob Aaron Estes, who previously made the underrated festival films Mean Creek and The Details. And while those films are creepy and weird in their own ways, Relive feels much more familiar. It’s basically a murder mystery whodunit, with an equally mysterious, time-travel sci-fi element. Think the Dennis Quaid-starring Frequency meets Christopher Nolan’s Memento. That level of familiarity doesn’t hurt the film, though, because it’s all blended together so well. Estes methodically structures the story, slowly doling out answers and posing more complex questions. For example, Jack doesn’t immediately answer these impossible phone calls, and once he does, he doesn’t instantly believe they’re real. It all unfolds rather logically. Early sections of the film are largely from Jack’s perspective and have a distinct visual palette. Eventually, that changes too, and we get Ashley’s side of the story with its own, slightly different look. Finally, once those two stories are up and running, Estes starts weaving them together and the whole movie just takes off. Those are the best parts of Relive, when both Jack and Ashley are trying to figure out what the hell is going on simultaneously and Estes integrates both stories. It leads to tense, uncomfortable, and emotional scenes between this uncle and niece who are somehow connected, and disconnected, from reality. As we slowly see things from one storyline match up with things in the other story (or, better yet, contradict each other) there’s a propulsive engagement to the film, eventually ending in some big revelations. Within this weird murder mystery, both Oyelowo and Reid ground their characters in reality. There’s real pain and fear in both of their performances, which makes the more fantastic elements that much more believable. Estes then rounds out his cast with welcome familiar faces like Mykelti Williamson (Forrest Gump) and Alfred Molina (Spider-Man 2), both playing cops, as well as Brian Tyree Henry (Atlanta, Into the Spider-Verse), as Ashley’s dad/Jack’s brother, who all elevate the already interesting material. Simply put, Relive is a watchable, engaging movie. However, the biggest problem is it sets up such a curious, cool story that when you get to the end, there’s really no wholly satisfying way for it to pay off. Estes does as good a job as possible, but his conclusion pushes most of the sci-fi elements to the wayside, focusing more on the strong bond between family members. It works, and probably makes more sense for a bunch of reasons but, personally, without a better payoff for the weird stuff, I couldn’t help but leave Relive a tiny bit disappointed. As entertaining as the film was, it doesn’t stick the landing. Relive was produced by Blumhouse and and will be released later this year, though it doesn’t have a date yet.